The two leaders will meet in the Black Sea resort city of Sochi to "discuss the latest developments in the region," Netanyahu's office said in a statement. 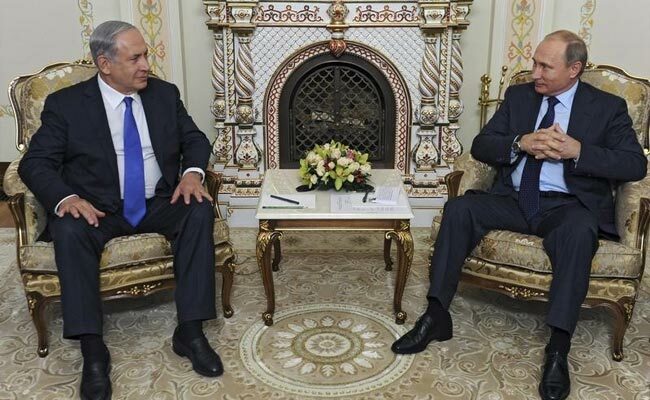 Jerusalem: Israeli Prime Minister Benjamin Netanyahu will travel to Russia on Wednesday for talks with Russian President Vladimir Putin, mainly focussing on the war in Syria, his office said late Saturday. Such talks have allowed the two countries to so far avoid any confrontation between their air forces, as Russia conducts airstrikes in support of Syrian President Bashar al-Assad's regime. Israel has sought to avoid being dragged into the civil war, but has carried out strikes to prevent arms deliveries to the Lebanese militia Hezbollah, which fights alongside Assad's forces. Israel's army has carried out nearly 100 strikes in the past five years on convoys carrying weapons to militant groups in Syria and elsewhere, former air force commander Amir Eshel told the Haaretz newspaper on Thursday. In March, Russia's foreign ministry summoned Israel's ambassador over air strikes close to Moscow's forces near the historic Syrian city of Palmyra. At the time, Israel's intelligence minister Yisrael Katz told AFP that in general, Moscow was not informed of Israeli strikes in Syria ahead of time, even though a "hotline" was set up last year to avoid accidental clashes between the two countries' forces.